iZettle E-commerce: is it right for your business? ⌂ > Ecommerce > iZettle E-commerce: is it the right choice for your business? Britain’s high street retailers are dwindling in numbers, as consumers rely more on online shopping for all of their needs. In the face of all that, it’s no wonder Europe’s market leader in mobile card readers, iZettle, has branched into ecommerce. 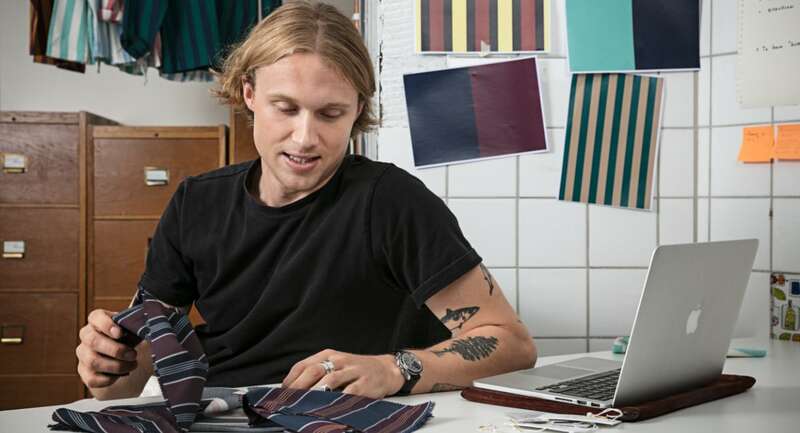 iZettle E-commerce is aimed at small businesses looking to grow (or stay afloat) through ecommerce, while also selling face-to-face. You don’t need particular experience with websites to set up an online store – just follow the instructions in your iZettle account, step by step. But how does it work, and is it right for your business? 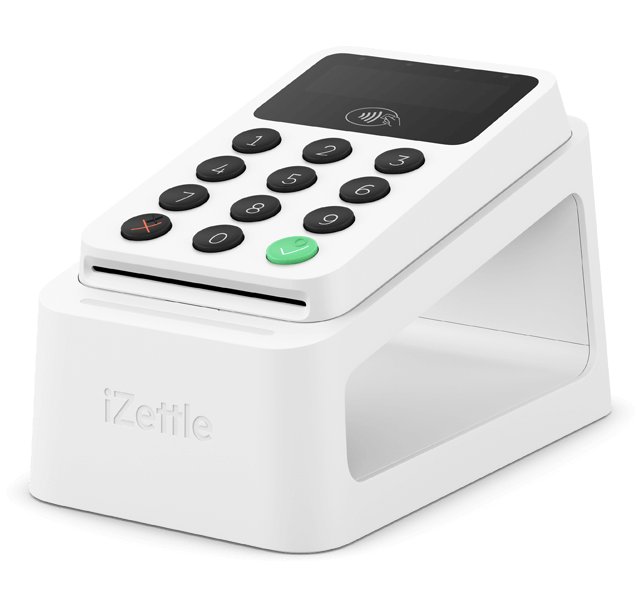 As the name suggests, iZettle E-commerce is a platform powered by iZettle that allows you to sell online. It is different from many other ecommerce platforms, because it’s set up to run so all the sales and product information in your iZettle account are synced up. If you’re selling at a point of sale via iZettle Reader, it makes setting up an online store really user-friendly and quick when you have products, stock counts, prices, etc. already added in the iZettle system. The online store can accept Visa, Mastercard and American Express cards as well as PayPal. The E-commerce platform costs £29 a month to use through the iZettle Go Plus subscription, which includes all the tools you need to customise your online store and integrate smoothly with your face-to-face iZettle Reader sales. Apart from the monthly fee, you pay a 2.5% transaction fee for everything you sell online. There is no lock-in contract – you can cancel any time at no extra cost. Payments are processed daily by iZettle, who deposits the money – minus transaction fee – to your chosen bank account within the following 1-2 days. If you have a PayPal Business account, you can also accept PayPal payments from customers, which iZettle only charges 2% for. These payments go to your PayPal account immediately, after which you can manually withdraw the money to your bank account from there. It’s clear iZettle E-commerce’s many features are a result of careful considerations of what’s important to merchants. Small online businesses with little resources need things to be efficient in order to be cost-effective. Inventory management and detailed product profiles. Create discount codes for buyers. Add your terms and conditions to the checkout page. Shipping tools to make it easy for you to manage customer orders. Real-time shipping rates displayed to customers, with the ability to ship internationally through well-known shipping carriers like DHL and UPS. Ability to refund payments online. Marketing and customer retention tools like abandoned shopping cart follow-ups. Sell on social media via ‘pay’ links. Detailed sales analytics with option to split point-of-sale from online sales. Your own built-in blog that’s ready to use and post on. On top of these features, you get customer support from iZettle seven days a week on the Go Plus plan, and more POS features than the free iZettle Go app has. 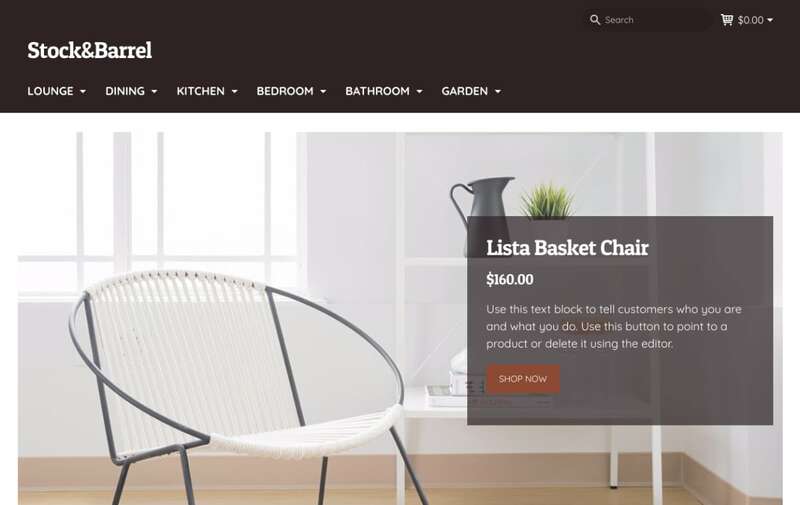 You don’t need to be a seasoned web designer to create an online store – not if you’re using iZettle, anyway. 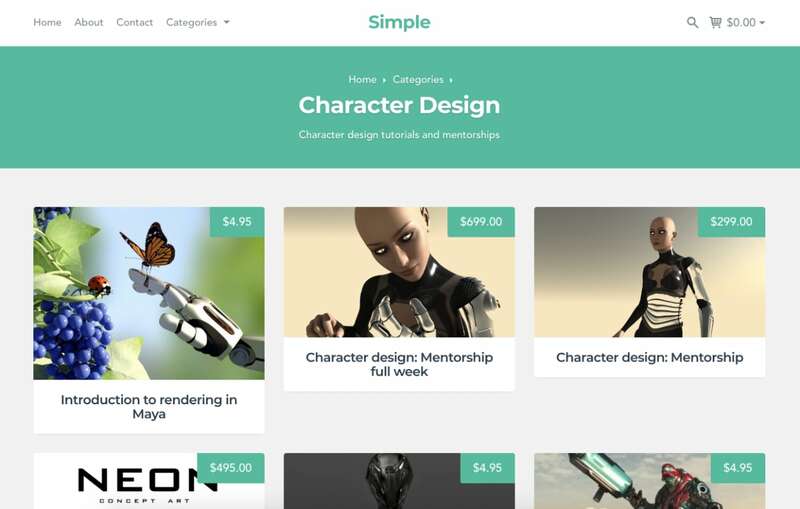 The plan includes many website themes you can pick from, then customise easily through drag-and-drop (similar to how Wix works). No coding is needed, and the design and text elements are easy to figure out intuitively as you go along. Just one thing would make your job easier: to have at least some idea of how your shop should look. All the templates are mobile-responsive, i.e. they adapt to the screen size of the device you’re visiting the website on. This is important, since more and more people are buying online from their smartphones. If you’re not that tech-savvy, you’d be pleased to know that iZettle can handle everything needed to set up shop online. This includes getting a domain (e.g. www.name.com), getting a free SSL security certificate (the padlock icon next to a web address in the URL bar – it means the website is trusted and secure), and free hosting (where your website is stored on a server). If you already have all or some of these things sorted, you can use what you have and integrate iZettle on your existing website instead. If you’re getting a new domain through iZettle, just be aware that you purchase this separately, as is the norm online. 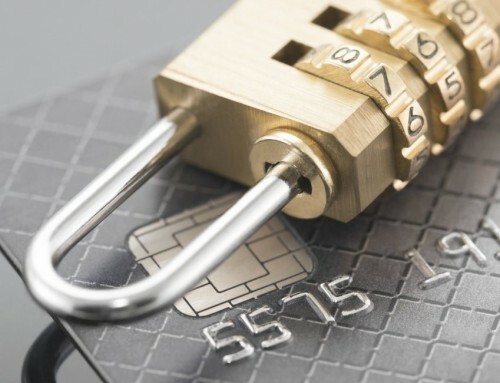 iZettle acts as the secure gateway so your customers can purchase securely through iZettle’s system wherever the payment links are integrated, including the ‘buy’ links you can add to your social media channels. What does iZettle E-commerce integrate with? 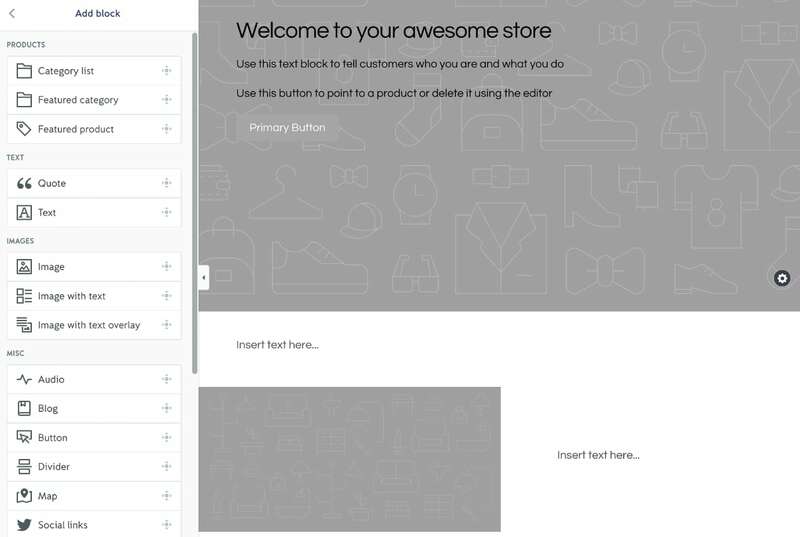 If you don’t need to build a new website, you can still integrate an iZettle online shop on an existing Wix, WordPress, Squarespace or any other website platform where you can insert a piece of code to add iZettle’s shop elements. The web store can be linked to your social media channels, such as Facebook, Twitter, Google+ and Vimeo. With a Facebook Business page, you can set up a Facebook Shop that enables people to buy your products through Facebook. Setting this up is actually easier than you might imagine, since iZettle automatically syncs the products in your account with the Facebook Shop, or you can choose just to sell particular items through Facebook ads. All sales are processed in the backend by iZettle, not by Facebook. It is even possible to add a Facebook Messenger chat to the corner of your website, so customers can chat to you directly about any questions they may have while browsing your website. iZettle also integrates with marketing tools, including MailChimp (emails/newsletters), Disqus (user comments), Campaign Monitor (email marketing) and Yotpo (product reviews). Those with an eye on SEO can integrate the site with Google Analytics to track visitor numbers, user behaviour, and much more. Detailed sales analytics are already included on the Go Plus plan, but you also have the option to integrate with Xero and Debitoor for more advanced accounting and reports. If inventory tracking is important to you and you want to stick to using iZettle Reader, it’s a no-brainer to just use iZettle E-commerce. Dealing with one payment provider makes life simpler, and iZettle is generally known for their user-friendliness. But what are the alternatives? 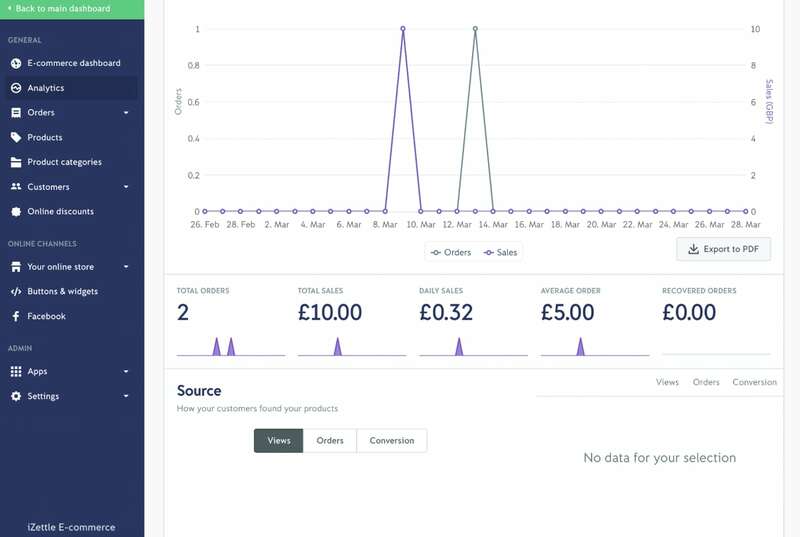 If you’re selling the same things via your point of sale and online shop, it makes sense to use one system for all those sales to make accounting easier and save time on the daily reports. 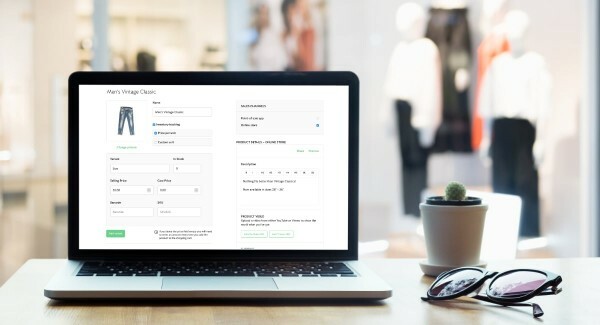 If your online shop is completely separate from face-to-face selling, or you’re just focusing on online sales, iZettle E-commerce would do the job as well, but there are other options that can be better for this. In the end, what you choose depends on your business needs. For instance, if you sell unique products like artworks, Etsy could be ideal. In fact, it doesn’t make much sense to add one-of-a-kind products in a product library created for point of sales to be efficient selling high volumes of the same products. Etsy is an online marketplace with many visitors ready to find your products, but an Etsy profile is just that: a profile, not your own website, but with an easy payment system. It’s usually a must today for product-oriented businesses to sell online – but a simple ecommerce system can lift the admin burden. 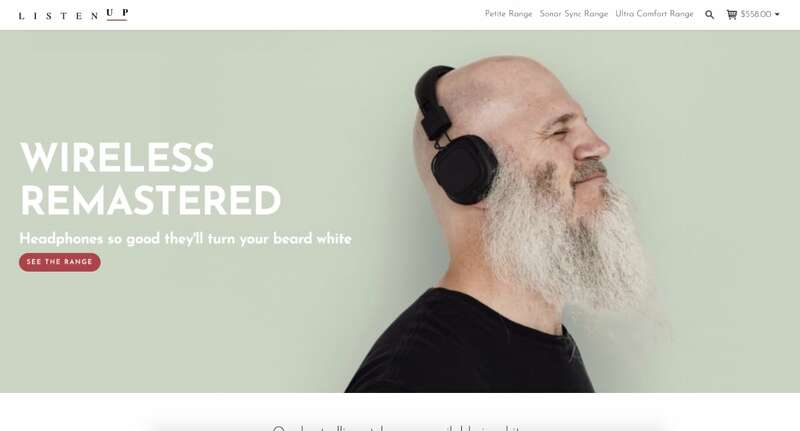 If easily-achieved, fancy designs are priority, Squarespace is a candidate, but their ecommerce customisations can appear a little rigid. Shopify, on the other hand, has a lot to offer online stores with their comprehensive product libraries and website customisation features. WordPress is generally more difficult to set up if you’re not confident dealing with websites, but it has endless customisation opportunities. With WooCommerce, for example, you can turn a WordPress site into online store and still integrate with your iZettle point of sale via a plugin. However, this requires looking online for a plugin, and the implementation is not as straightforward as using iZettle E-commerce. Related: iZettle vs. Shopify: what’s the best POS and ecommerce combo? It’s no coincidence iZettle chose to include E-commerce in their full-package point of sale app Go Plus, which is made for face-to-face retail businesses. It is not for the restaurant-specific iZettle Pro users or the free iZettle Go app users with simpler needs, but mainly for small businesses that need to branch into ecommerce as a supplement to trading at a physical location. iZettle E-commerce doesn’t require special knowledge in web design or online sales. Setting up an online store front is made as easy as can be, but iZettle also gives you plenty of ways to sell through different channels. That said, there are better ecommerce platforms out there for more complex product management, more design customisations and other complex needs. Best for: shops that need to survive and expand into ecommerce, without the technological hurdles.